Even though Pitch is young, he has the same speed of an adult Night Fury. His good eye has a small teal ring around it when in in the right lighting. He has one horrible scar across his eye and three across his foot. The fact that they are all on his right side indicates that his attacker drug its talons across his face. Because of this, his eyesight is not as well as it would be and mostly relies on echolocation at night. Pitch has a mild overbite. Pitch is highly intelligent and can understand human language and knows how to use some human tools. Pitch is very bossy and he only does something if he wants to do it. When Pitch doesn't get his way, he holds a small grudge against that person and it will take a bit to get him to listen to them again. 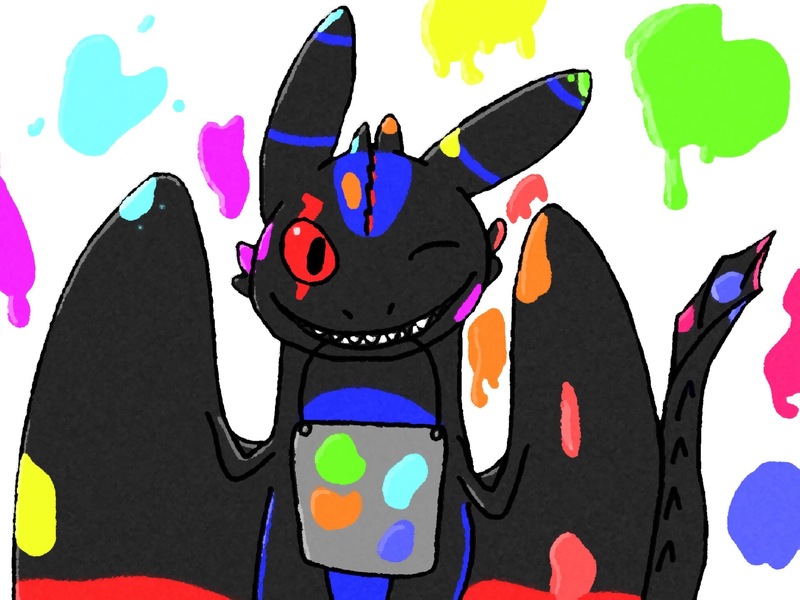 Pitch loves to "draw" in the sand and take paint brushes (or sometimes buckets) to "paint"
Pitch barely likes fish, but will eat eggs, chicken, and even apples and oranges. Pitch is very grumpy most of the time. Well... half grumpy. We should say in a annoyed mood. Even then, he deals with it and stays very sweet. When he is not in a annoyed mood, he is afully lazy and will avoid doing anything physical. He is very quiet and shy. Suspicious about anyone that isn't family. He has a huge crush on Sapphire, a Night Fury Stormcutter hybrid. While it's pretty obvious they have feelings for each other, neither of them have either confirmed nor denied this.